Some say location is everything. Well, a beautiful location for your wedding does certainly help! 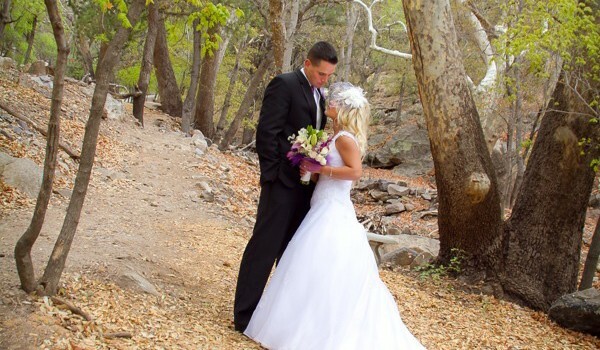 Ramsey Canyon Nature Preserve is one of the most stunning outdoor environments in the Sierra Vista area and Sara and Matthew were smart to have their wedding right outside the preserve. The weather that morning started off looking bleak. Amazingly, the sun came out just in time for the bride to make her grand entry and it held all the way until will we were done with our bride and groom photos. In fact, we had the most gorgeous light during the whole ceremony and beams of sunlight kept beaming down on Sara and Matthew, lighting them up in an almost magical way. After the ceremony, we accompanied the couple into the canyon for some breathtaking backgrounds. Despite a very chilly day, we were having a great time. And as fate would have it, the rain held out all the way until we decided we had taken our last photo! That must be a good sign for Sara and Matthew!